Food has always been a key part of Jewish culture and community, and so we’re glad to share some recipes from our members and friends. Here’s a challah recipe from Board Member Dana Rudolph. If you have any recipes you’d like to share (especially for a dish that gets praise at our onegs), please contact us! This is a variation on a recipe from King Arthur Flour. I substitute honey for the sugar and lower the baking temperature a bit. I use it for traditional braided challah—and I substitute it into their recipe for Apple Challah, since I like the dough better. Instructions for both are below. Let sit for about 45 minutes. This lets the yeast get a head start—otherwise a sweet dough can take an excessive time to rise. Mix in stand mixer with a bread hook and/or hand knead together until ingredients form a ball. You may need an extra tablespoon or two of flour depending on the weather and how carefully you measured the liquids. Place dough into an oiled bowl. Cover it and let it rise for 1 1/2 hours, or until not quite doubled in size. Turn dough out onto a lightly oiled surface and fold it over once or twice. Divide into three pieces, and roll each into a strand about 18″ long. Place the strands next to each other on a lightly greased or parchment-lined (or Silpat-lined baking sheet. Braid from the middle of the strands, not the ends: right over center, left over center, and repeating until you reach the end. Then turn the baking sheet around, and starting from the middle again, braid the other side, this time center over right, center over left, until you reach the end. Working from the middle like this gives a nice taper from middle to either end, rather than a loaf that is fat on one end and skinny on the other. Alternatively, go to YouTube and search “challah braiding” for any number of other ways to braid (or just shape into one big log—it won’t be as pretty, but it will still be tasty). Brush the loaf with the egg mixture. You won’t use it all; save the rest for a second application later. Place loaf in sealed, moist location to rise. I like to put it into my microwave (off) with a cup of hot water next to it. Others may prefer to cover it with lightly greased plastic wrap. Let it rise for 45 minutes to an hour, or until almost doubled in size. About 15 minutes before that time is up, preheat the oven to 350°F. Brush loaf with more of the egg mixture and sprinkle with poppy and/or sesame seeds, if desired. Bake 20 minutes and then cover loosely with a sheet of aluminum foil. This is critical so that the loaf doesn’t brown too much. Bake another 15 to 20 minutes, until it is golden brown, slightly firm, and the internal temperature is 195°F. Remove from oven and cool completely on a rack before slicing. 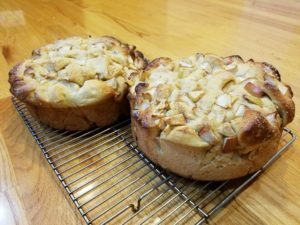 This is also a variation on a King Arthur Flour recipe (Apple Challah), but I like the above dough better, so I use it instead of the one they suggest. I like to do this about 15 minutes before the dough has finished its first rise, so that some of the apple juices are extracted. I then spoon off the extra liquid so the finished loaf is less likely to be soggy. Take the dough after the first rise, and press into a rough rectangle about 10 by 12″. Slice the apple-filled dough lengthwise (I use a serrated bread knife) and then crosswise in half, then each piece crosswise in half again, and each piece in half one more time, until you have 16 pieces total. Filling will fall out and ooze. This is fine. Pick up the pieces and place into a greased, 2″ deep, 9″ round cake pan or springform pan. (I also like to line the bottom with parchment.) Tuck in any extra apple pieces. Let rise for about an hour, or until it just crests the rim of the pan. Brush with egg wash and sprinkle with coarse decorating sugar, if desired. Place in preheated 325-degree oven and bake for 20 minutes, then cover loosely with aluminum foil to prevent over-browning. Bake another 40-50 minutes until top is brown and center is not gooey. (Test with a toothpick or skewer.) Cool for a few minutes, loosen around the edges and remove from pan, and cool fully on rack.